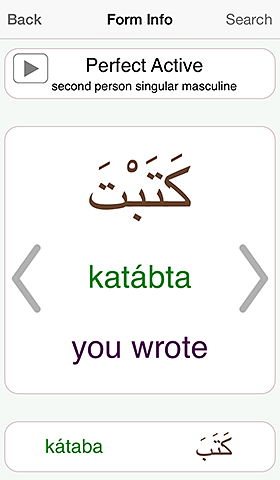 The CJK Dictionary Institute (CJKI) is proud to present to the world the ultimate tool to master the complexities of the Arabic verb system: the CJKI Arabic Verb Conjugator, or CAVE for short, for iOS and Android. See more glowing reviews of CAVE. 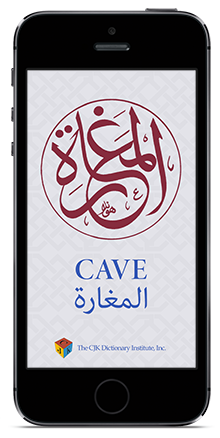 CAVE is based on the author's (Jack Halpern) decades of experience in learning fourteen languages and in developing popular learning tools and dictionaries, including a beautifully designed Arabic learner's dictionary that provides a full understanding of basic Arabic words. The developers of CAVE have spared no effort to ensure that looking up verb paradigms is not only quick and easy but also enjoyable. 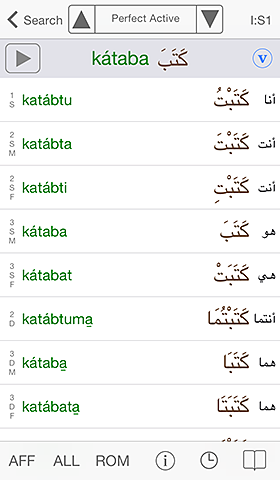 CAVE puts at the user's fingertips a wealth of detailed information on every aspect of Arabic verb conjugation. 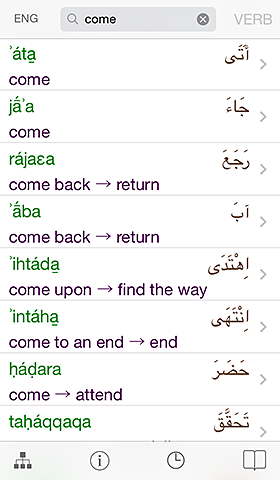 In fact, Arabic teachers have praised CAVE as a powerful learning tool that is likely to revolutionize Arabic pedagogy for both native and non-native speakers alike. See also the CAVE brochure and a detailed document with help screens. A major feature of CAVE is that it is a bilingual conjugator that gives concise English meanings for each inflected form. 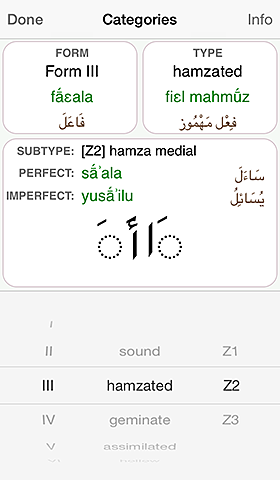 A unique feature of CAVE is the use of CARS romanization, a new system for accurately indicating pronunciation, including word stress (á)and neutralized vowels (a̱). 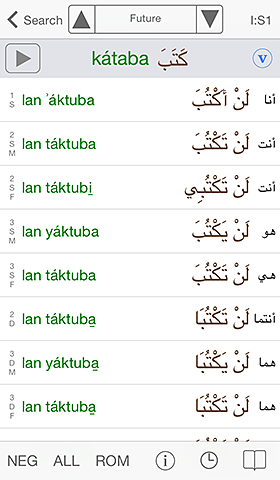 Negative forms are useful since different particles are used for different tenses, e.g.لَنْ in لَنْ أَكْتُبَ lan ʾáktuba 'I will not write' but لَا in لَا أَكْتُب la̱ ʾáktubu 'I don't write'. The Form Info Screen provides more information on each inflected form in large, easy-to read fonts. 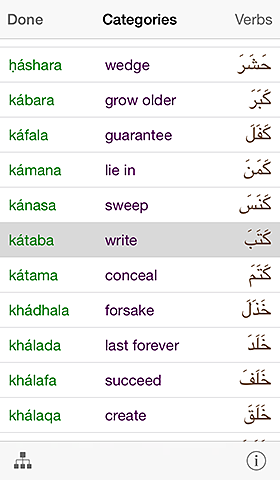 The Verb Info Screen provides detailed grammatical info and English meanings on each verb in large, easy-to read fonts. The functional user interface gives access to grammatical info, audio, filters for negatives, plurals, English/Roman script, same-category verbs, and more. The Full Input Mode enables even beginners to input any inflected form to quickly locate verbs without knowing the root or the dictionary form. 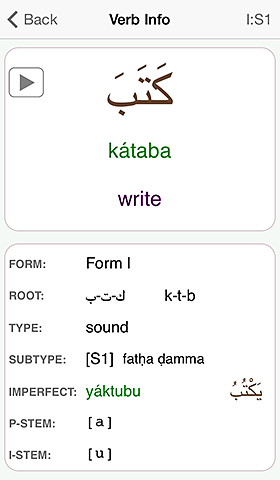 The Root Input Mode allows input of the verb's root in Roman or Arabic scripts to display all the verbs derived from that root. 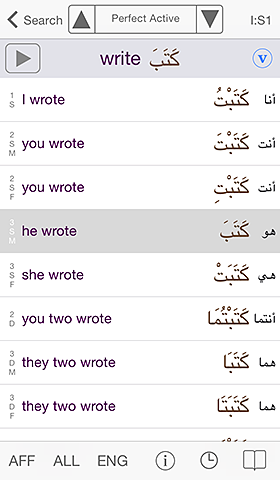 The English Input Mode allows the learner to quickly find any Arabic form from its English meanings, including partial matches. 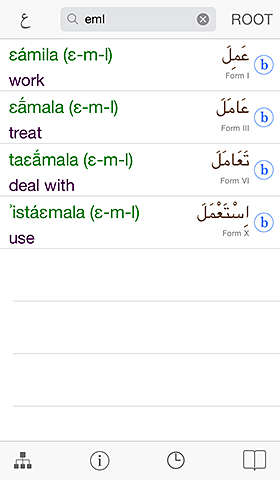 The Tense Selector allows the user to select and display the conjugation paradigm for the desired tense. 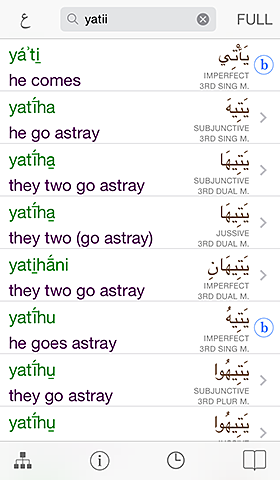 The list of verbs of the same category is convenient for comparing verbs that conjugate in an identical manner.